Monk: From October 2013 to October 2014, barbecue writer Johnny Fugitt ate at 365+ barbecue restaurants across the lower 48 United States and compiled his own rankings into a book, The 100 Best Barbecue Restaurants in America. 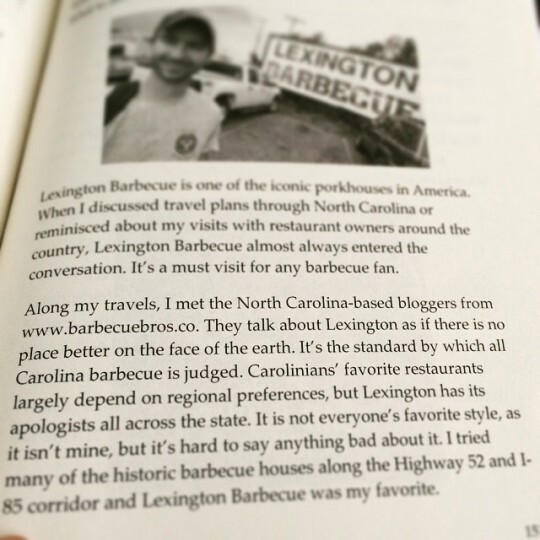 His rankings were not based on marketing or TV exposure or from compiling previous lists together into one mega list (as many barbecue lists tend to be), but by one man driving across the US in a Subaru judging barbecue through his own palate. Speedy and I met up with Johnny last year in Charlotte and was able to get a private tour of the commissary kitchen of Boone’s Bar-B-Que Kitchen where they smoke their meat and do their prep work for the food truck. We’ve continued to keep in touch with him via email and Twitter and consider him a friend of the blog. Full disclosure and all that: Johnny was kind enough to provide complimentary signed copies of his book to both Speedy and me. Though Speedy forgot and bought another one from Amazon anyways (never a bad thing to support a writer, however). Speedy: That’s right, Monk. I was being supportive, not forgetful. Anyway, in terms of the book itself, I really like the way Johnny went about it. There’s so much subjectivity to these lists that Johnny made sure to tell the story behind why he did this in the first place, his methodology, and a little bit about each trip he took. He was very specific about both what he liked and didn’t like at each place. Monk: As for the list itself, it’s broken up between ranking his top 25 and then the remaining 75 restaurants are unranked and listed by state. While there are some of the usual suspects on the list, there are some glaring omissions that he wasn’t able to get to (Scott’s Bar-B-Que, La Barbecue, or Killen’s Barbecue) or some that folks might scratch their head at (a non-Franklin or La Barbecue Austin pick for #1 overall, a Florida joint in the top 5, etc). But that’s ok, because that was the whole point of the book. For NC and specifically Charlotte, I was happy to see some of our favorites represented on the list. We covered this in a previous post, but Midwood Smokehouse and Boone’s Bar-B-Que Kitchen were both decently represented in the book – both in terms of the restaurants themselves on the unranked list of 75 but also particular dishes (brisket for Midwood and brunswick stew and sauce for Boone’s). Speedy, what were your thoughts on the list? Speedy: As I mentioned above, I like the way Johnny went about it, but of course, I don’t agree with the rankings 100%. I think it’s a little Texas heavy and anything that doesn’t have Lexington BBQ in the top 25 (it does make the top 100), doesn’t line up with my taste completely. However, I think that’s the point. What I do like is that anywhere in the continental 48 I go, I know someone has been there before me to figure out if there’s anywhere worth trying. That alone is worth the price of admission. Monk: Agreed. If I had any minor complaints, I would have liked to have seen full color photos, but I’m assuming that came down to a budget issue. In any case, while I may not agree completely with how the rankings shook out, I can’t fault Johnny’s hustle. Definitely a worthy read.